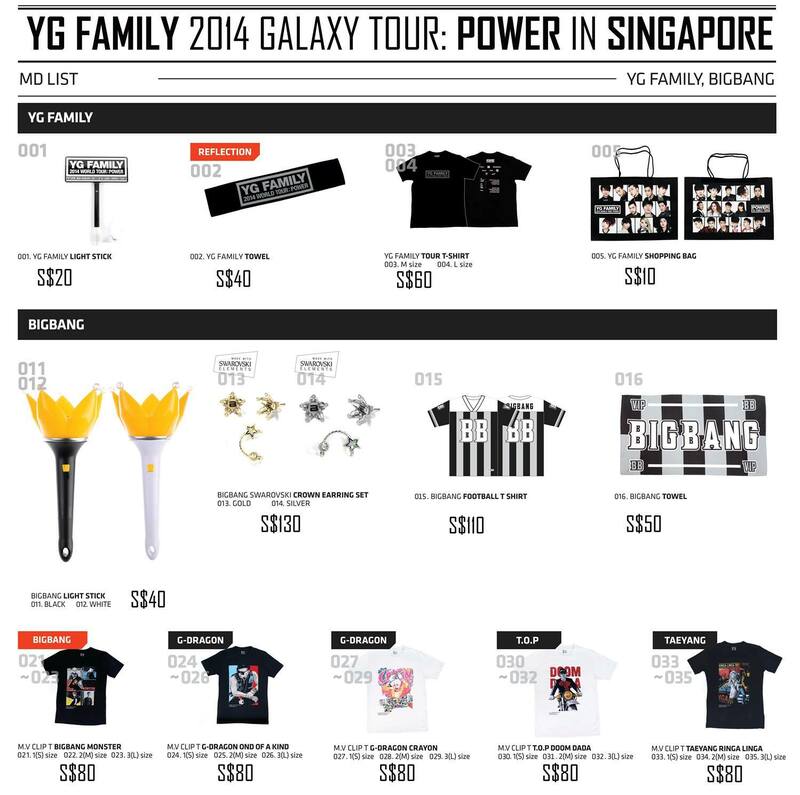 The wait is finally over as YG Entertainment, the undisputed leader of K-POP music that houses top K-Pop stars like PSY, BIG BANG, 2NE1, together with Samsung Galaxy will be bringing the first YG Family 2014 Galaxy Tour: Power in Singapore this September! 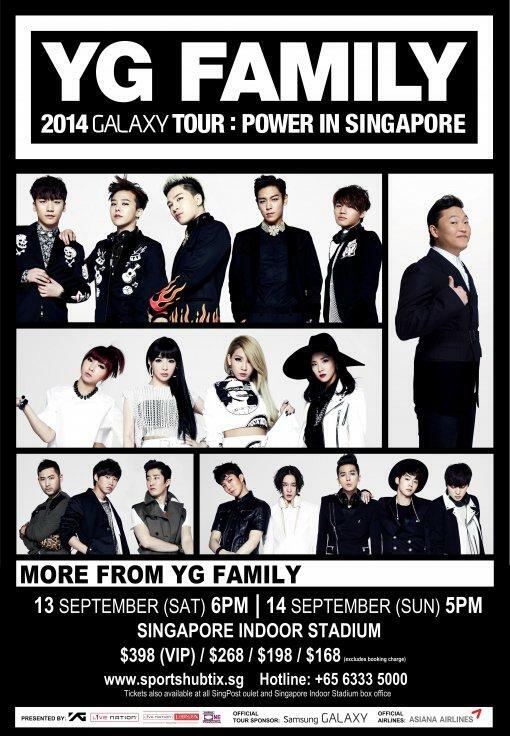 In addition, this will be the ONLY show in Southeast Asia, the first ever YG Family Concert in Singapore! PSY, who created a worldwide ‘Gangnam Style’ craze by ranking #2 on the US Billboard ‘Hot 100’ for the first time as a Korean Musician, and ranked No.26 with his recent new single ‘HANGOVER’ featuring American hip-hop legend Snoop Dogg. BIGBANG, the leading K-POP boy group who achieved unparalleled success by appearing before 800,000 audiences around the world on their 2012 Alive Galaxy Tour. EPIK HIGH, who released their new single ‘With You’ in May in collaboration with top Chinese female artist Zhou Bi Chang, and received high popularity by hitting No.1 on Youku New Singles Chart and Weibo Weekly Chart. WINNER, YG’s most anticipated boy group since BIGBANG’s debut 8 years ago has garnered attention since their appearance at the Korea reality show “WIN : Who Is Next?”. Tickets go on sale from 19 July 2014 (Sat), 10AM across all SPORTSHUBTIX channels. Do note that merchandises may be sold out early and that every lightstick purchase is limited to two. 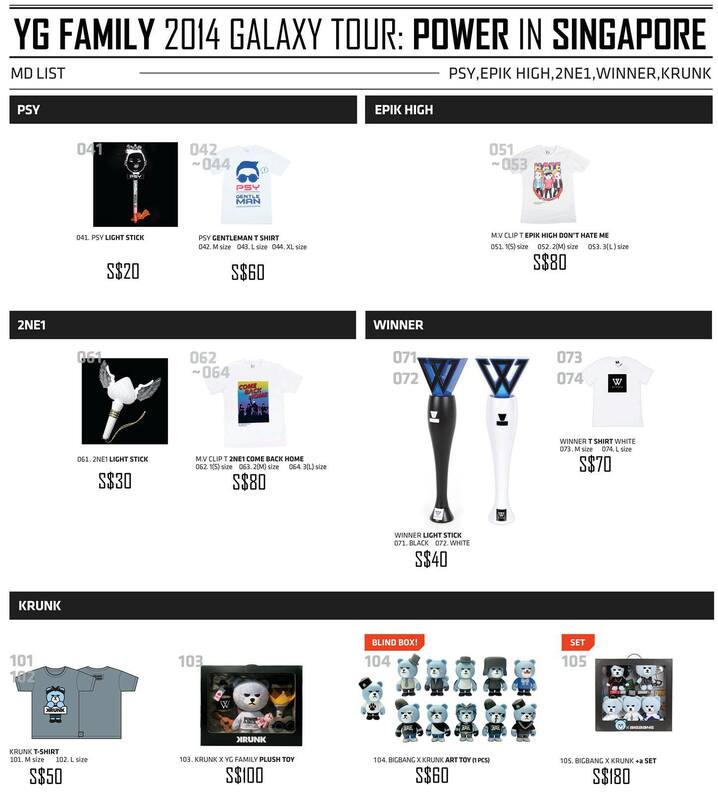 Merchandises will only be sold on event day and payment will be in cash. 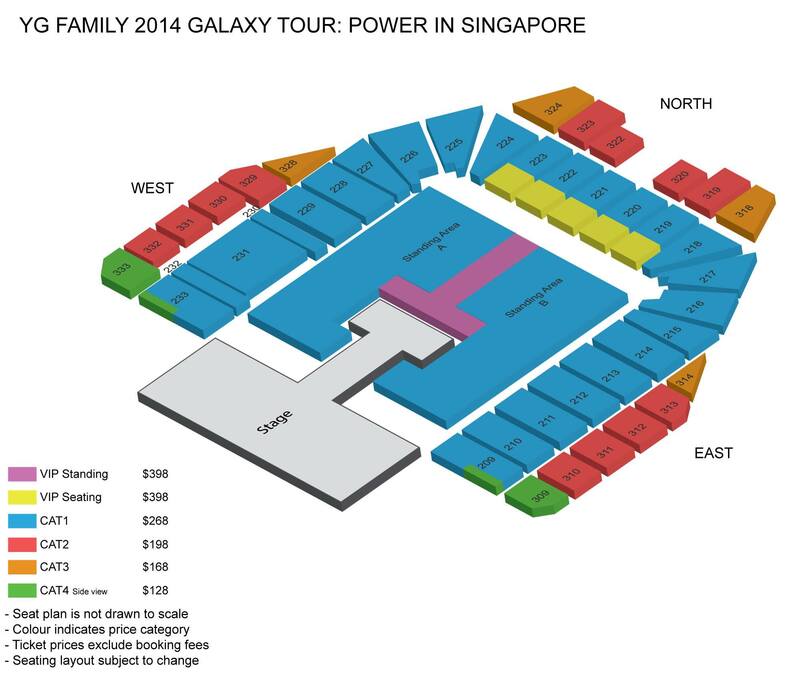 YG Family 2014 Galaxy Tour: Power in Singapore is presented by YG Entertainment, Live Nation, Live Nation Lushington Singapore and ONE Production.